BENTIU, 24 September 2014 (IRIN) - The 47,000 people who have fled to the UN base in Bentiu, South Sudan, lack most things. In some parts of the camp, 158 people are forced to share one latrine. Women and children swelter for hours waiting for their turn at a borehole. August downpours destroyed mattresses and clothes and replacements are virtually impossible to come by. The only thing there is too much of is the toxic green water - left over from last month's rain - a stagnant pool across much of the camp that flows into people's homes with each new storm. The situation is especially hard on certain groups - the elderly, single mothers and people with disabilities - who have few resources to call on when they run low on food or need to buy medicine. Overstretched aid agencies are helping, but people still have to make concessions, whether it is risking their safety to gather firewood outside the camp or trading their food rations for medicine when a child falls sick. And still people keep arriving, including 500 more last week, looking for a measure of security and some services, which they can no longer find in the areas around Bentiu. "The problem is fear and food," said Subodh Vijapure, the water and sanitation manager for Concern Worldwide, one of the first agencies to start work in the camp. "For that, they just kept on walking for days to get here from where they are hiding." Nyalada Maliut turned up in July. In mid-January, the widowed mother of seven was shot three times when one of the frontlines passed through her rural home. She was treated for a week before a group of armed men stormed the hospital and forced all of the patients to flee. With her children, she retreated to a swamp and for six months they lived on a thin porridge made from dried water lilies. When Maliut's youngest son started to show signs of malnutrition, she decided to make the dangerous trek to the UN base. They arrived safely and the two-year-old was quickly enrolled in a feeding programme Concern is running. 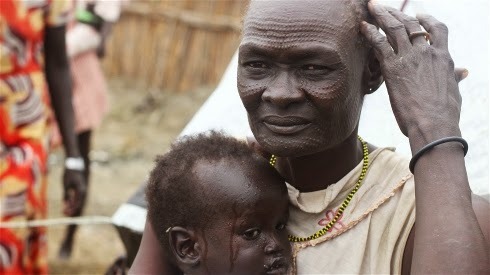 But she worries her other children are not getting enough to eat. Now she has joined the line of women leaving the camp each morning to collect firewood outside the camp. Ten women have been raped outside the base since the end of August, according to the UN. But Maliut takes the risk because if she can make some extra money by selling the firewood, she will be able to afford to supplement the rations of sorghum the family receives from the World Food Programme (WFP). She is not disappointed she came to the camp, but frets "the services that are here are not enough. I'm just tired." No one was prepared for this level of need in Bentiu. At the start of South Sudan's conflict in mid-December, the UN opened its bases to people seeking safety. There are now more than 100,000 people gathered at 10 camps, also known as protection of civilian, or PoC, sites. "Until not too long ago, Bentiu was one of the least of our concerns, almost," said Derk Segaar, who heads the protection team for the UN Mission in South Sudan. "Around April we had around 2,000 people in the PoC site. It was very small. And we had a huge amount of space." On 15 April there was a particularly brutal battle in the Unity State capital, which included the massacre of hundreds of people seeking refuge in one of the town's mosques. Tens of thousands of people fled to the PoC just as the seasonal rains started, rendering any improvements to the camp - which is built on a flood plain - impossible. It also made it dicey to land anything but helicopters on the town's dirt runway, throttling the pace at which supplies can arrive. Humanitarians have been playing catch-up ever since. There are currently 16 agencies active in the camp, with more than 70 aid workers. Four health clinics are operating, but do not meet all medical needs. At first the priority was trying to get everyone into shelters and start feeding them. By June, at least three children each day were dying of malnutrition. As feeding centres brought those numbers under control, the problem of acute watery diarrhoea arose - probably linked to the standing water. In one week earlier this month, aid agencies recorded 131 cases. Meanwhile, much of the camp's infrastructure fell apart in the floods. Houses flooded and toilet blocks collapsed. Concern's Vijapure estimated there was a gap of at least 900 latrines at the moment. During the height of the storms, some people slept standing up for weeks at a time. Better than going outside, though. Government soldiers are positioned around the town and reports place rebels just outside. There are persistent rumours that fighting could start at any moment. "It is very clear just how fragile the security situation is and how afraid people are that things can go bad," Segaar said. "Because nobody in their right mind would want to stay." Elizabeth Nyadom is sharing a shack with her sister and their combined eight children in the middle of the PoC. They came in May because Nyadom's oldest son, James, is handicapped and cannot move easily. It was becoming more and more difficult to find someone to carry him to safety each time fighting broke out. A foul-smelling pond laps against their door. Every time it rains, the two sisters hurriedly scoop water out of the hut. While they work, their children, including James, crowd onto their only bed. If the water ever climbs above the height of the bedframe, Nyadom would not be able to rescue all of the children from drowning. "Sometimes we have to stay for the whole night removing water," she said. But at the moment that is not her main problem. A health worker had diagnosed one of her other sons, Gatwich, with malaria, but the clinic was out of medicine. She had to dip into their small store of money to pay for his treatment. If anything else goes wrong, she will have to start selling their food rations. Still, she has nothing but praise for the humanitarian groups that are working in the camp. "They are doing a good job," she told IRIN, "it's just that there are too many people and too much rain." Others, less content with the situation, have decided to take matters into their own hands. Thiyany Bapiny, for one, needs money now. The 62-year-old saw most her belongings washed away in last month's flood and had no way to buy replacements in the small, but overpriced market that has sprung up in the PoC. And she is convinced that because of her age, she will be overlooked if aid agencies do distributions. Earlier this month she decided to take the store of sorghum she received from WFP and brew alcohol. The practice is illegal in the camp because authorities are afraid it will promote violence, so Bapiny did much of the work in the early morning before UN Police patrols started moving around. It is an intensive, days-long process, but she said it was worth the time and loss of food. She has been able to sell a cup of the murky brown drink for five South Sudanese pounds apiece - about US$1. After one batch, she can afford to buy vegetables, oil and salt from the market to supplement her food rations. She is already brewing her next round and plans to use future money to build a new hut in a higher area of the camp so she won't lose any new belongings to future floods. "I know the alcohol can cause trouble," she told IRIN. "But it's my only way of creating work." The Danish Refugee Council's Bruce Spires is managing the Bentiu camp. He knows they cannot make everyone happy, but there is a short-term plan in place for the remaining weeks of the rainy season, focusing on pumping out as much water as possible and improving the drainage situation. But it is the dry season, which should start in October, that will be critical. The main tasks will focus on making the PoC "more flood resistant for next year's rainy season," he told IRIN. That will require bringing in sand and soil to raise much of the camp. Because the camp is so crowded, that might also necessitate moving each household individually, some aid workers said. In the midst of the overhaul, they plan to more evenly distribute latrines, water points and health services. South Sudan's rains generally start in April, which means "we have 20 weeks to reorganize the camp in a safer way," Spires said, or face the same situation next year.